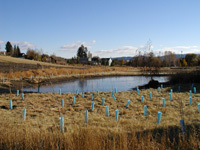 The purpose of this project was to create a wetland along a tributary to Paradise Creek with the following benefits: flood control, native habitat for wildlife, filtration of pollutants, recreational and educational opportunities and improved water quality for a tributary to Paradise Creek. September 2002: In the fall of 2002, two shallow excavated wetlands were created at the site. The wetlands range from a width of 80 ft to 40 ft span approximately 275 ft in length and have an organic shape. The depth throughout the wetland ranges from 1ft to 1-1/2 ft. The wetland area is fed by a spring located in the northern portion of the project. The spring was directed to concentrate its flow to the wetland area. In addition to the spring, the wetland design allows the waters of the adjacent stream to spill out over into the area while providing a defined channel for water movement in low flow situations. The 3-ft berm that is located on the east side of the stream will be removed to allow for the extension of the floodplain. Approximately 895 cubic yards of soil was excavated from this site. The excavated soil was relocated onsite. Fall 2002: In the fall of 2002, native species of woody shrubs, trees and grasses, were planted along the bank to provide shade to the stream and wetlands. Herbaceous wetland plants were planted in the wetland to help improve water quality by reducing nutrient loading through filtering. All plantings are protected from vole damage with plastic tubes. Spring 2003: Native Willow and Cottonwood cuttings were planted along the banks of the stream to secure the banks and introduce shade to the system, creating a woody riparian buffer. Woody riparian buffers offer many benefits, including filtration of runoff, wildlife habitat and flood water retention. The project site is located along a tributary to Paradise Creek in a draw located North of F St between Mountain View Rd. and Cleveland St. The stream segment is bordered by a steep bank on the east side and a wide flat wet area to the west. The project site is inundated for a significant portion of the year and is a suitable location for a wetland. Reed canary grass is the dominant vegetation along the stream segment. Few trees or woody vegetation are present on site. The project is located directly downstream from a horse farm and is therefore impacted by associated pollutants entering the water from upstream. The landowner’s vision for the eastern portion of his property is to have a pick your own farm. This picture shows the backyard stream before the wetlands were created and before the planting began.